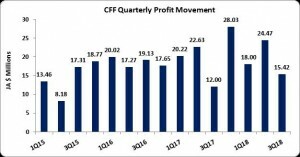 For the nine months ended March 31, 2018, Caribbean Flavours & Fragrances Limited’s (CFF) revenue increased by 1% to $302.98 million relative to $300.67 million for the comparable period in 2017. For the quarter, the Company generated gross revenue of $88.72 million, a marginal increase year over year. Cost of sales also increased for the period to $184.38 million. This compares to the prior year’s figure of $181.71 million, representing an increase of 1%. Gross profit decreased slightly to $118.60 million for the period in review and compares to the prior year’s amount of $118.97 million. The company had a marginal year on year decrease in total expenses to $67.66 million down from $67.97 million in 2017. This was attributed to a 8% decrease in selling & distribution expenses to $3.05 million (2017: $3.32 million). Administrative Expense for the period was relatively flat at $64.61 million versus the prior year’s corresponding total of $64.65 million. Consequently, profit from operations for the period remained relatively flat at $50.94 million versus $51 million booked for the nine months ended March 2017, while for the quarter there was a 23% increase from $10.97 million to $13.51million. The company reported an 81% increase in net finance income from $3.85 million in 2017 to $6.95 million in 2018. As a result, net profit for the period amounted to $57.88 million representing a 6% increase from the comparable period’s figure of $54.85 million, while for the quarter, net profit increased 28% from $12 million to $15.42 million. The earnings per share for the quarter amounted to $0.17 (2017: $0.13), while earnings per share for period totaled $0.64 relative to $0.61 in 2017. The twelve month trailing earnings per share is $0.96. The number of shares used in this calculation was 89,920,033 units. As at May 14, 2018 the stock traded at $12. The company, as at March 31, 2018, recorded total assets of $442.95million, an increase of 14% when compared to $388.49 million for the prior year. Cash and bank balance increase to $95.54 million from the $33.65 million reported in prior year. the overall growth was tempered however by a fall in short term investments which closed at $145.43 million (2017: $173.13 million). Total Stockholders’ equity as at March 31, 2018 closed at $388.45million, an improvement of 21% from $322.21 million last year. This resulted in a book value per share of $4.32compared to a book value of $3.58 for the last year.